Glen, Thanks for including NAAIP on this article. Some clarification. 1. On "the" insurance-forum all references to NAAIP are non-existent. Check it out. I apologize in that "the forum" deleted your post. I believe that it was deleted because NAAIP became the topic of conversation. 2. The default website when a agent signs up is a bit congested. It is up to the new website owner to edit the website owner to edit website to their business (i.e. un-congest the site) and put the website on their own domain name in the proper format. Here is an example of an Life Insurance website https://www.naaip.org/jack and Medicare https://naaip.org/jack1 and Auto https://naaip.org/jack2. You see, not congested. 3. The IMO part of NAAIP is not and will never be so important to us. If agents want to contract and make sales. Great. No big deal. NAAIP is a tech company that wants everyone to use our technology for FREE. 4. Obviously, since NAAIP gives stuff away with no catches. We cannot be so friendly on the phone (time is money!). 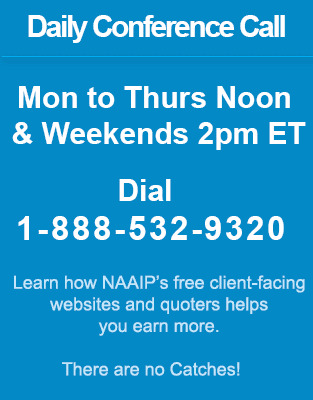 Yet, NAAIP has a daily conference call at Noon ET every day. At that call we are friendly. 5. Glen, I love your lead systems, give us a call and we can figure out a way for our 8,051 registered users (as of Dec 30, 2017) to get leads from Lead Heroes!